My plan for a normal, natural birth ended in an emergency cesarean section. And the downhill spiral that was my birth didn’t get me off to a great start breastfeeding my new baby. The first time we tried breastfeeding was the most unnatural thing. The midwife came and held my baby to my breast, she said just try and “put her there.” But she didn’t want or show any interest. After a wriggle and some repositioning, my baby did half a latch and fell asleep. I cried and was sick to my stomach. I had imagined this day to be a beautiful journey ending with my baby and I breastfeeding in pure bliss. We tried everything: every position, breast compression, you name it. After about 7 days my baby had recovered from her traumatic birth and I felt a new motivation that we would get the hang of breastfeeding. Occasionally, she latched but no longer than 5 minutes. So I pumped. The feelings I had after the birth, and now the failure of breastfeeding had taken away a lot of my confidence about this whole mothering thing. And when I pumped I felt in control, I actively saw what I produced and most importantly, I saw my baby drink and be happy and content. As a mama you would do anything to provide for your child. And I did, I pumped for 12 long months, day and night with alarms set every two hours . . .
Use pumping to establish a good milk supply. If you are exclusively pumping, you’ll want to stick to a strict routine of every 2-3 hours around the clock. Pump every time you feed your baby. Expect an oversupply when your milk first comes in, and save it for later! The amount you are pumping in 24hrs can greatly vary from mama to mama. It depends on the “magic number” the number of times you pump in 24 hrs to effectively “empty” your breasts to reach the maximum milk supply. Baby’s daily milk intake will grow slowly over the first 6 months, and then stay around the same and decrease when introducing solid foods. Do not panic when you first start pumping that you might only see a little milk come out. Pumping is a skill you have to master first. Consistency and a good routine are the key to build up a milk supply. Pumping milk, like breastfeeding, works on supply and demand. Once you have decided to pump exclusively, it is important to have a strict routine and stick to it in order to reach a good milk supply to cover babies needs. The more you will pump (demand) the more milk will be made (supply). 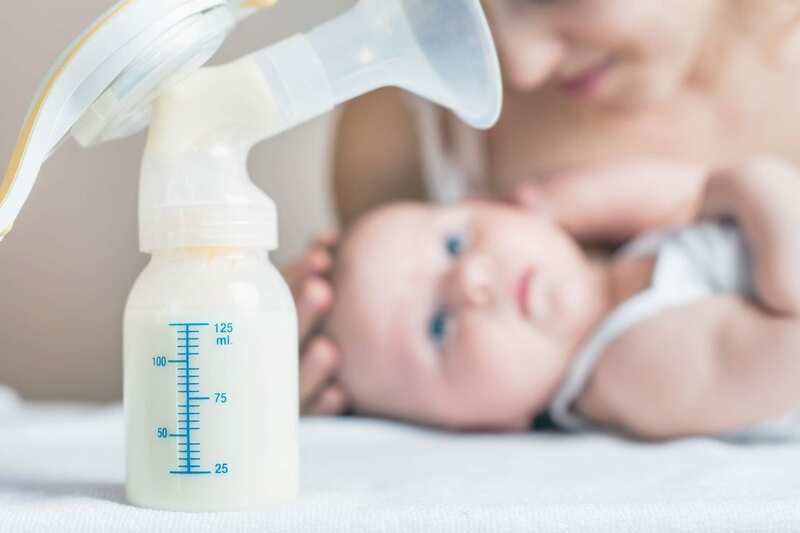 If you’re concerned about supply, one tip for increasing milk supply is to do a “power pump.” Simply pump for 15 minutes on each breast, take a 10 minute break and repeat. You can repeat as many times as you like in order for your milk production to spike a little. Pumping is a big commitment. Find a way to motivate and reward yourself each month your reach a milestone. Invest in making your pumping spot as cozy and comfortable as possible with a comfortable nursing pillow, a nice smelling candle, a dim night light, an eye mask, and an iPod full of relaxing music. Invest in a comfortable and effective double pump, with various settings to mimic baby’s feeding behavior. Learn how to hand express! Gentle breast compression and massage before and while pumping can help to increase your milk supply, as does holding baby skin to skin. I decided to pump because it made me feel in control when I wasn’t in so many situations. And I desperately wanted to feed my child with my milk, the alternative it gave me to my rather painful and heartbreaking breastfeeding journey helped me overcome thoughts of failure. And pumping IS breastfeeding, too. Well done to all pumping mamas out there, you are doing an amazing job! Breastfeeding counselor, wife and mother of two.